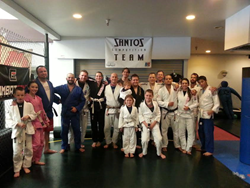 Jon Santos announces the opening of a new San Ramon, California location for Brazilian Jiu-Jitsu classes. "Students who come in with a positive attitude and commit themselves to hard work can become very talented quickly." Jon Santos, along with Team Santos Jiu-Jitsu, are excited to announce the opening of their new gym in San Ramon, California. The gym will be having classes six days per week and is offering a promotional special to celebrate their new location. New students will receive one week of classes for free. In addition to the one free week offered to new students, Team Santos will also be starting a Referral Program. Those who refer a friend (who eventually signs up), will receive a free month of classes or a free GI. Two other instructors will add their training and experience, Jay 'JJ Machine' Santos and Chris Glynn. Jay is a purple belt who started training in Jiu-Jitsu with Ralph and Cesar Gracie over 18 years ago. He holds multiple gold and silver medals from the U.S. Open & the Gracie Open. Chris Glynn is the Muay Thai Instructor and he has 16 years of experience in Muay Thai kickboxing. He currently trains at Old School Boxing Gym in Concord, Ca. Jiu-Jitsu is a very effective self-defense discipline that offers good opportunities for physical work-outs, plus incredible fighting techniques that can give a smaller opponent the edge. Once Jiu Jitsu is learned and perfected, an individual has better mental strength, physical endurance and enhanced cardio conditioning. The work-outs burn fat and help improve health and fitness.